My buddy Kell Robertson will headline a local tribute show next month for the late Utah Phillips. Also on the bill are Joe West, Georgie Angel, Kendall McCook, Mitch Rayes and Richard Malcolm. 78-old New Mexico “beat” poet-songwriter Kell Robertson will make a rare public appearance to headline A Tribute to Utah Phillips concert at Santa Fe Brewing Company, Monday, July 14, 2008, starting at 7 pm. Joining Kell onstage to honor their mutual friend and inspiration, the late bard Utah Phillips, will be Joe West, Kendall McCook, Mitch Rayes, Richard Malcolm (of Burning Moonlight) and White Buffalo Music Presents Georgie Angel. Additional guests and friends of both Kell and Utah are expected to show up and sit in. Bill Nevins, contributing editor of Albuquerque ARTS monthly, will MC the evening. Admission is only $5 at the door, and fine food and beverages will be available. This will be a rousing evening of music, stories, poetry and gentle rebellion, as befits the memory of the late Utah Phillips, the widely beloved songsmith, union advocate and raconteur who collaborated with Ani DiFranco on Grammy-nominated albums. 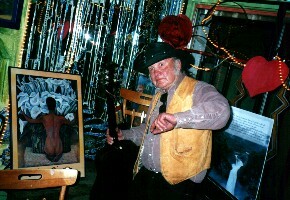 Kell Robertson, a long time friend and comrade-in-song of Utah Phillips, is himself an American treasure who has lived quietly in the Santa Fe area for the past ten years. He has performed his music and poetry from San Francisco to New York City .. For several years he tended bar and performed at the Thunderbird in Placitas, where he played and sang with the likes of Lightnin' Hopkins and hosted poetry and sang at Silva's Saloon in Bernalillo.